I've been tidying up around the house and stumbled across a bag of yarn that went to Virginia and back. I had these grandiose ideas that I'd just sit and craft while spending evenings talking with my daughter. Yeah, I overpack. I could have left that bag and a couple other things behind because I didn't need them. In putting away the bag, I realized fall is fast approaching and I didn't do any crafting during what was the summer. Not a thing. One of my friends periodically posts a number of days to Christmas post and that seriously scares me. Will I be ready? 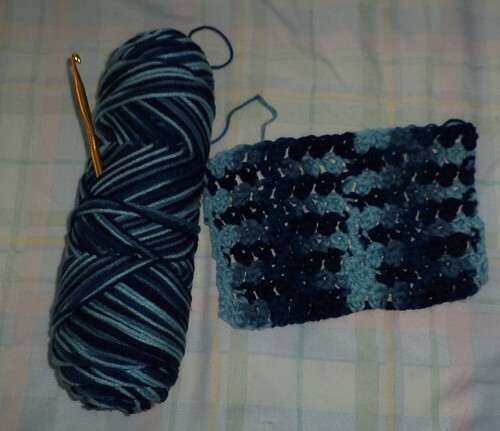 So, this week, I sat down, hauled out the crochet hook and began crafting. Then, I found the list with all the names and the colors and realized, I don't have that many left to make and I will be done. Funny how that happens.